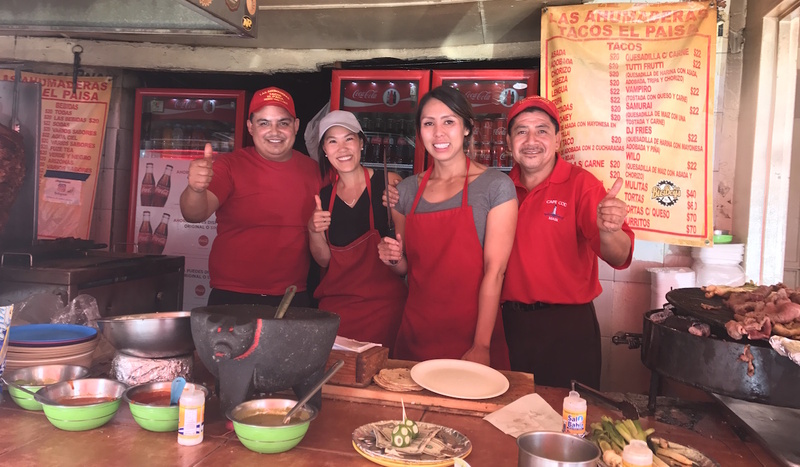 On my daytrip to Tijuana via San Diego, my friend and I followed in the footsteps of Anthony Bourdain and visited Las Ahumaderas, nicknamed in the English-speaking world as Taco Alley. 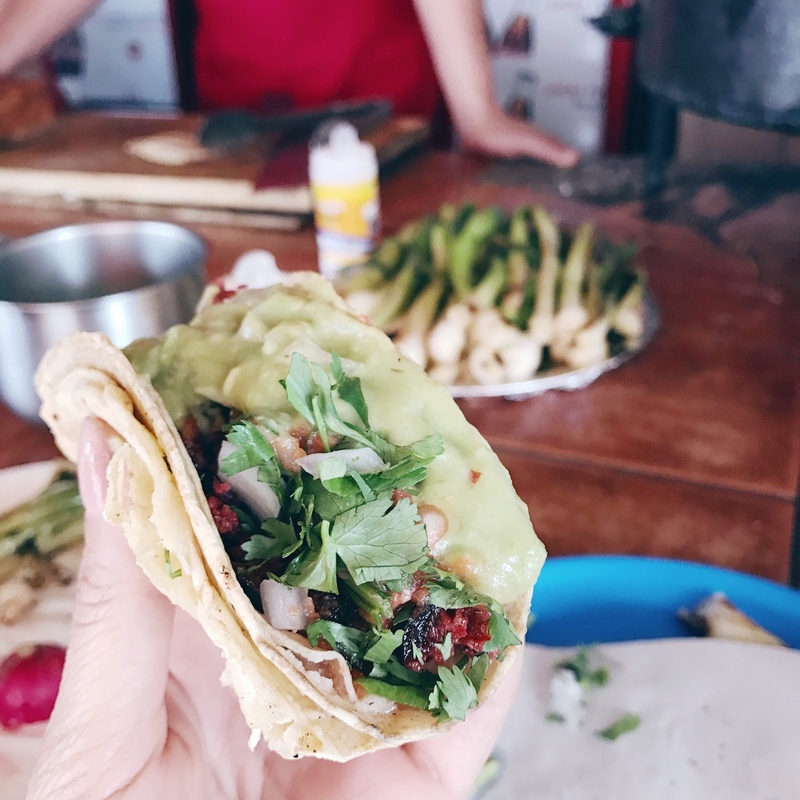 Somewhat hidden on the side street of Avenida Guillermo Prieto, Taco Alley is known for its 5 to 6 taco stands located all in a row. We didn’t see much differentiation between each stand, so our plan was to start at the first stand, and eat a different item from each vendor. Each stall has various meats (beef, chorizo, pork, etc.) sizzling on a grill. The tacos are made to order. The Mexican taco masters don’t really speak English so there was a lot of pointing to the Spanish menu signs. Watching them chop up the grilled meat with a big machete, and then tossing on the toppings including salsa and a fresh scoop of guacamole is like watching a practiced art form. Chopped radish and grilled green onions are served as sides. BBQ smoke will definitely blow in your face, so expect your hair to smell meaty by the end of your meal, but it’s all part of the experience! Carne Asada – Probably the most popular order, this is a grilled steak taco. Chorizo – Ground sausage, usually a mixture of beef and pork. Lengua – Beef tongue, yuck. Cabeza – Beef head, also yuck. Tripa – Tripe, AKA stomach lining. Vampiro – A crispier version of any of the above tacos, with cheese. Quesildilla – A taco topped with a melted slice of cheese. 2 tacos would make a good snack, 3 to 4 for a meal, and 5 to 6 if you’re a big eater! As we were only daytripping to Tiijuana from San Diego, we paid in US currency which they accepted. When tacos are only $1.20 USD each, you can afford to eat as many as you want. We liked the friendliness of Las Ahumaderas Tacos El Paisa, so we actually ended up having more than one taco at that stand. We even got a photo with them behind the counter! If you’re looking for the Anthony Bourdain episode where he visits Taco Alley, it’s in his Baja California episode of his 2012 series “No Reservations”.